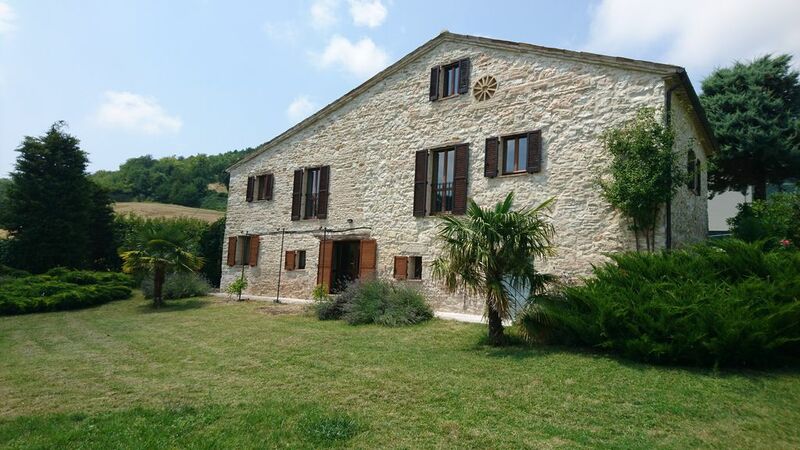 The holiday home "Mio Piccolo Castello" is located about 40km from the Adriatic coast and 60km from the provincial capital of Ancona. To the two next larger places Arcevia and Serra De'Conti and it is about 10km. The historic stone house was lovingly restored from 2004 onwards and is surrounded by a large, fenced garden with fruit and olive trees, Mediterranean plants and palm trees. From the garden and surrounding terraces you can enjoy beautiful views of the surrounding vineyards, olive groves and sunflower fields. The nearest bar with Alimentari is just 1 km away. There is really everything there for your daily needs. The nearest restaurant with a public swimming pool is only 1.5km away. The coast of Senigallia with miles of sandy beaches can be reached in about 30 minutes by car. A wonderful destination for hiking and swimming is the Parco regionale del Conero, an environmental oasis around the Monte Conero with spectacular views of the Adriatic cliffs. Be sure to try the local products and feel the original Italy with the spirit of the "good old days" in the narrow streets of the many small villages on the surrounding hills. Situated in a very small "borgo" Valdo, this was a perfect stay. We wanted to be away from busy city life and have only silence! We enjoyed for more then 10 days the beautiful restorated house and surroundings. Though kitchen is quite small, it is well equiped. We used the pizza-oven/bbq in the garden twice. The garden is big, very beautiful and has excellent view on typical Le Marche hills. There is plenty of garden funrniture. Our children enjoyed the small swimming pool. One night we heard wild boars just behind the fence of the garden. From the house we did some day trips: the caves nearby, but also the beach and Senigallia at the coast - only 1hour drive, but also further - Urbino, Perugia. Though the drive was quite hard.